or by phone on 01434 676852. For other events, please book with the venue. Full details are given under each event. Helen will lead a survey of top Merlot and Merlot-based wines from around the world - Saint Emilion to Hawkes Bay and lots in between. It's a rare chance to taste high quality examples of this approachable and often sublime variety from a wide variety of climates and soils. Jamie Harrison will introduce a personal selection of favourites, drawing on his detailed, deep and engagingly accessible knowledge of two of the world's greatest vineyards. There'll be at least four wines from each classic area - a fascinating range of styles, sites and vintages. Helen will survey the wonderful wines of Spain's North West - a first for us. As was as the superb semi-aromatic white wines made from Albariño and Godello, we'll taste wines from other excellent local varieties including the fine red wine grape Mencia. It should be a fascinating and revealing evening. A Tynemouth tasting last January revealed just how good the new wave of cheap and cheerful wines from Eastern Europe can be. 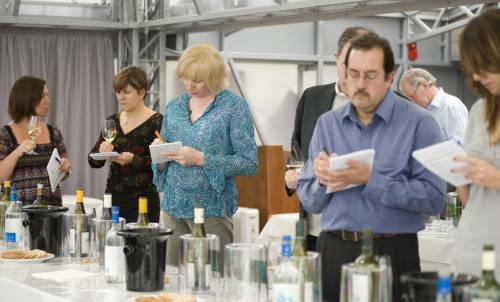 This is a chance, under Helen's expert guidance, to taste some of the very best wines. Local varieties proliferate in a wonderful mix of styles. This promises to be one of the best tastings we've offered for a long time. Not to be missed! or by phone on 01434 676852. Biodynamic Wines - Folly or Wisdom? (tasting postponed from the autumn). Everyone has heard of organic wines, but biodynamic wines are significantly different. Helen will explain a little of their history and profile today and will introduce a fascinating range of high quality examples from around the world. Are they really better than organic or conventionally-produced wines? We'll not be able to give a definitive answer, but you'll be able to taste some very convincing efforts. We hope to welcome Richard and Eric Chevalier to Tynemouth again to introduce their amazing wines and give you a chance to buy at cellar door prices in case a certain B****t door slams shut. More information as soon as we can. Greece, where wine-making seems almost as old as the hills, produces a marvellous range of flavours from a panoply of indigenous grape varieties. Modern wine-making has transformed an ancient craft and there's lots to enjoy. Instead of attempting to summarise the entire country in 8 or 9 wines, Helen will concentrate on just the white wines of the Cape, which will provide a fascinating and varied tasting. She'll reveal the latest trends and explore some of the best buys. Later in the year we'll turn to the reds. Tickets: £25, including a generous early buffet supper. A seasonal tasting if ever there was one: Helen will contrive a collection of love-themed wines (and not just pink ones) from around the world, including, of course, some excellent Saint-Amour from Beaujolais. It will certainly be fun - and tasty! The Douro (Duero) unites some of the greatest wine regions in Portugal and Spain. Helen will introduce complex, aromatic dry whites and fabulous, full-bodied reds from both sides of the border and will round things off with a delicious glass or two of port. The Rhône is home to some of the world's finest grape varieties (Syrah and Viognier perhaps the best-known) and fabulous rich, silky reds in which Grenache bosses the blend; while the sweet wines from the south are sheer bliss. Come and taste Helen's carefully-chosen selection of some of the best. Bergerac (one of Helen's favourite regions) is one of France's better kept wine secrets - forget the cheaper bottles you occasionally find in supermarkets, but indulge yourself with an elegant diversity of complex, flavourful wines that are superb partners for fine food. Think Bordeaux but with a lot more generosity! What could be better to be in Burgundy just as Spring blossoms into Summer? Eight nights as usual - first and last nights at the Hôtel de France in Abbeville, the rest of our time at the Hôtel La Gremelle in the very heart of the vineyards at Ladoix-Serrigny, just north of Beaune. Transport, as usual, will be with Weardale Travel. The detailed programme, booking forms and more information will be sent out very soon, but this, we hope will enable you to get the dates in the diary. We are delighted to announce (Helen says, "I don't know quite how we've managed this!") that the cost will be same as last year: £1499 per person in a shared room (a modest single supplement is available).